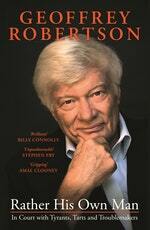 Queen’s Counsel, civil libertarian, Rhodes Scholar, human rights advocate, UN war crimes judge, defender of condemned men, academic, father, husband, author and broadcaster – Geoffrey Robertson’s colourful life has impacted untold people in many ways. 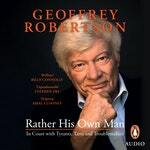 In his memoir, Rather His Own Man, Robertson charts his progress from pimply state schoolboy to the Old Bailey and onwards and upwards to a leading role in the struggle for human rights throughout the world. He explains in the book’s introduction, ‘This is the story of a life lived in and between Sydney and London, by an expatriate determined not to become an ex-patriot – a dual citizen whose prostate is felt in Harley Street in London and whose teeth are fixed in Sydney’s Macquarie Street. (If you have seen an Englishman smile, you will understand why. 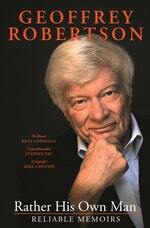 )’ Witty, engrossing and featuring a cast of the world’s most thought-provoking characters, through this autobiography Robertson illuminates a unique perspective of the people and events that have punctuated his life as an international lawyer at large. Here we shed light on a handful of finer details to surprise and delight. As a fourteen-year-old Robertson took a speed-reading course, and fast-tracked his way through a list of the ‘world’s best books’. Dickens’ Great Expectations was to have an enormous impact on his life. (Forty years later he was even allocated the very same flat in the Middle Temple occupied by Pip in the story – more on that later). But it wasn’t orphan Pip, kind blacksmith Joe or eccentric Miss Havisham with whom he found connection. The Dickens character who inspired Robertson most: Mr Jaggers the Old Bailey lawyer, naturally. Robertson is a Master of the Bench of Middle Temple – one of the four Inns of Court of English barristers. The Temple was the home of the crusade-fighting Catholic military order of the Knights Templar until its dissolution in 1312. Later that century lawyers began occupying the premises, and since then the Inns have been used largely for legal education purposes. The Middle Temple badge, the Lamb of God in the centre of St George’s Cross, remains as a symbol of its armour-clad origins. Among a long list of notable cases, in 1971, as a junior counsel, Robertson worked with Rumpole of the Bailey creator and QC John Mortimer on the now infamous OZ obscenity trial – a magazine to which he’d previously contributed. Already the subject of much Obscene Publications Squad scrutiny, OZ magazine UK’s May 1970 edition landed its editors a charge of ‘conspiracy to corrupt public morals’. After the longest obscenity trial in British history, the three were found not-guilty of obscenity, but were sentenced to imprisonment (and forced haircuts) on lesser charges. They were later acquitted on appeal, to which the defendants wore wigs. In 2000, Robertson represented boxer Mike Tyson in a hearing before the British Boxing Board of Control. After refusing to stop punching his opponent after a 38 second victory, Tyson made comments to the effect that he was ready to rip out British world champion Lennox Lewis’s heart and eat his children. Facing charges of bringing the sport into disrepute, Tyson’s actions, argued Robertson, amounted to freedom of artistic expression. Though the board disagreed, the boxer retained his licence while copping a £125,000 fine.